I had a mooch round the West End sales last night. I didn’t buy anything, but feel like I missed out. The people around me clutching their designer shopping bags saved hundreds of pounds on the original price. When my credit card bill hits the doormat in early February, I won’t be suffering a debt hangover. With average credit card rates over 17% (and many people paying rates of up to 40%), getting 20% off a pair of shoes in the sales will soon look like a false economy when the interest on your credit card wipes out the savings. Winter’s not over yet and a lengthy cold snap could drive up my gas bill significantly. Less spending now means less scrimping later. By making do with the clothes I’ve got, I’ll lessen my environmental impact. And shabby chic is bound to come back into fashion at some point in 2012. My stress levels will be much lower. Oxford Street isn’t the most calm-inducing place at the best of times. 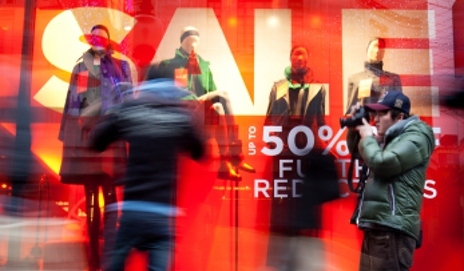 Do you fall for January sales? Of course, savvy shoppers can pick up a real bargain. Those with kids can stock up on cheap clothes for the year. And, if you’re really organised, you can buy next year’s Christmas cards now while they’re half price. Still, that’s not what I’m talking about here – I’m thinking of those items that you wouldn’t normally buy and don’t really need. Take the lovely red sweater I spotted in the Barbour shop. Those who know me well also know of my impressive jumper collection. I don’t need another one, but it had £60 off the original price! Very tempting. Jessie J may well exhort us to ‘forget about the price tag’. But many of us have bought items in the sales not because we really needed, wanted or could afford them, but because we’re seduced by the 50% off sticker. Time for some willpower? OR prolong its use by a further number of years/months…..
appliances, furniture, rugs ecetera being thrown or given away. Footfall does not necessarily equate with profit margins. underwrite the cost of those purchases. Went to have a look at a range of electrical goods in Comet to furnish the kitchen in our new house – dishwasher, washing machine, tumble dryer, microwave, fridge freezer – a big outlay! Even at reduced sale prices they couldn’t match the non-sale prices of several other electrical retailers, especially the online ones. They weren’t even willing to offer an overall reduction on the combined price of the goods, so we left and they lost out on several thousands of pounds! Not a very effective business model. I often choose the sales to buy new products – but I always research on the Internet to check before going shopping. My new years resolution is to not buy any clothes this year unless I make it myself, I know its boring but I have more than enough! I have given in to temptation in the past, but now financial circumstances mean that I only buy something when needed, not just when it is “reduced”, and can honestly say that I have never regretted not buying something – in fact, sometimes I get home and try to remember what it was that I really liked, and can’t! And my wardrobe is still more than adequate……….